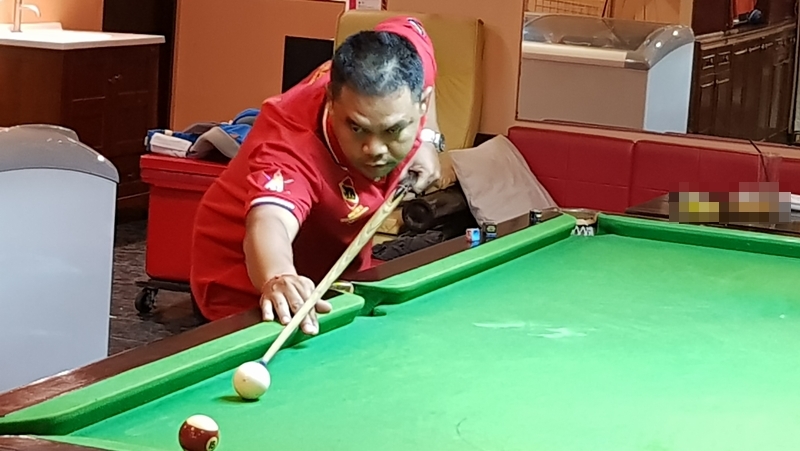 POOL: With just two weeks now remaining in the latest season of the Patong Pool League (PPL), Caddy Shack are now favourites to take home the winner’s title. Kwans Birdie Team, who currently sit in second place, still have their free week to go so are guaranteed to drop off the pace, while third place Natalie Bar are still five points off the table toppers and will only be in with a chance of taking the title should Caddy Shack drop some serious points in their remaining two games. But who says that miracles do not happen! The twentieth round of the PPL, sponsored by Thailand Pool Tables, Genius 2 Garden and Restaurant and Tualek Whisky, was played last Thursday (Oct 4) and with Caddy Shack being on their free week pressure was on Kwan’s Birdie Team to keep their title hopes alive as they were set to play Ting Tong Bar. Goh, Mike and John from Kwans won their singles and doubles matches as did Nick playing for Ting Tong. However, the Birdie Team won the beerleg in two sets and the match with an 8-3 scoreline. Martin Swiss had a home game against Happy End, who were well prepared, but Oye was hospitalised and had to be replaced by Andrew BD. Happy End won five singles and three doubles games and it looked like it could be a monster of a win again for Happy End. However, Martin Swiss were revitalised for the beerleg which they won in two sets but lost the game 3-8. Kiki Sports Bar played away to Red Light in what is seen by the league as the battle of the French barowners. Kiki were leading 4-2 after the singles but Red Light came back strongly and won the evening with a 6-5 score. Natalie Bar were scheduled to play at home against Simon & Oil’s last Thursday but as Simon & Oil’s were away on a trip to Buriram the game was rescheduled for yesterday (Oct ). It was a tightly fought game with the end score being 6-6. Wombat Bar were set to play against Genius, however, their contract in OTOP ended at the end of September and they are still trying to finds a solution as to where they can play their remaining games. Meanwhile, Caddy Shack made the best of their free week by having new cloth installed on their table so they are well prepared for the new season and their final game against Natalie Bar in two weeks time. The penultimate round of the Patong Pool League will be played tonight (Oct 11) with the End of the Season Party to be held at Genius 2 on Oct 25 starting at 7pm. Any bars interested in joining the next season, which will start mid November and run until the end of April 2019, please get in touch via the Patong Friendly Pool League Facebook page.